Let’s talk about Mudbray and Mudsdale. To start with the obvious: Mudbray is a donkey, and Mudsdale is a horse. The two species are actually about as distant from one another as horses are from zebras (which get to be their own Pokémon), but I suppose donkeys are not exactly among the most fascinatingly exotic animals in the world, so it’s understandable that for Pokémon’s purposes they would get lumped in with horses as a “close enough.” Donkeys are proverbially known as stubborn animals, because they have very different fear responses to horses – horses bolt when frightened, but donkeys freeze, and usually give very few external cues to express their discomfort, so someone who only knows horses will often think a startled or cautious donkey is being “stubborn” by refusing to move. You could probably ask, fairly, whether the same might be true of Mudbray, who merits a description by the Pokédex as “stubborn” and “individualistic” (unlike horses, donkeys are not naturally herd animals) – maybe that reputation comes from inexperienced trainers who haven’t been taught how to handle them. 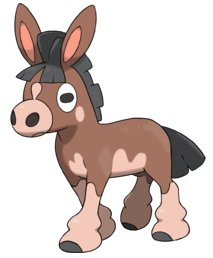 Mudbray’s… honestly quite disturbing… blank-looking round eyes are probably meant to reinforce this aspect of her personality, making her look a bit vacant and detached – although the unnerving oblong pupils seem to be based on the appearance of a real equine eye. On account of the rough terrain of their natural habitats, where strength matters more than speed, donkeys are actually stronger for their size than horses. In Mudbray’s case, this translates to a carrying capacity of “50 times its own body weight” – over 5 tonnes. As usual, it’s probably best to think of numbers in the Pokédex as more illustrative than literal – even if a Mudbray might not actually be able to support the weight of a fully grown African elephant, after seeing one in action you might believe it. I don’t want to review these Pokémon. I really don’t. Sadly, they’re sitting there in the Pokédex, right after Timburr, Gurdurr and Conkeldurr, and I don’t exactly have much of an excuse not to. 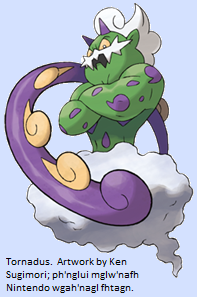 So… with as little ado as possible, let’s get started on the vibration Pokémon, Tympole, Palpitoad and Seismitoad.